For decades, omega-3 fatty acids have been praised for their myriad health benefits. Credited with helping treat or prevent degenerative illnesses such as heart disease, rheumatoid arthritis, diabetes, and even Alzheimer's disease, they also play a key role in brain development and cognitive function. However, the benefits of omega-3s –– and DHA in particular –– also come at an inevitable cost, according to researchers at UC Santa Barbara. Over a lifetime, they can lead to cellular disease and a significant decrease in cognitive function. 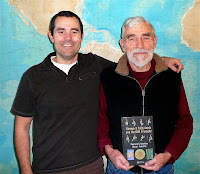 The scientists, the father and son team of Raymond C. and David L. Valentine, have compiled their work in a new book titled "Omega-3 Fatty Acids and the DHA Principle" (CRC Press, 2009). In humans, omega-3s are essential fatty acids that are necessary for health, but cannot be manufactured from scratch by the body. They are obtained largely from fish and other marine organisms, such as algae and krill. The body uses several types of omega-3s, including two "fish oils": eicosapentaenoic acid (EPA), and docosahexaenoic acid (DHA). "DHA and EPA sit atop a hierarchy of omega-3s and provide the most clear health benefits," said David Valentine, associate professor of earth science at UCSB. His father, Raymond Valentine, is a professor emeritus of plant sciences at UC Davis, and a visiting scholar at the Marine Science Institute at UCSB. The elder Valentine's most recent research explores ways in which genes from ocean organisms can be engineered into crop plants so omega-3s can be harvested and made easily accessible in the same way other oils, such as olive and canola, are. David Valentine is studying the energetics of organisms, specifically the roles of omega-3s and other molecules in cellular membranes. The oils are used inside organisms as membranes that surround cells. They serve as the host phase for many critical functions, including respiration and photosynthesis. The physical and chemical properties of DHA enable it to rapidly facilitate biochemical processes in the cell membrane. This effect provides numerous benefits, including those involved in the growth of bacteria, rapid energy generation, vision, brain impulse, and photosynthesis. The Valentines focus on the roles of omega-3 fatty acids in cellular membranes ranging from human neurons and swimming sperm to deep-sea bacteria, and they develop a principle by which to assess their benefits and risks. While other oils are used in membranes all over the body, omega-3s are far more specific in their location. They are found most predominantly in the brain, in the eyes, in certain other brain-like cells, and in sperm, according to David Valentine. "They are precisely targeted," he said. "And the reasons for that are twofold. Their physical and chemical properties enable specialized cellular functions, such as the rapid firing of neurons and the rhythmic pulsing of sperm tails. However, omega-3s are so chemically unstable that they oxidize and go rancid very quickly, and are therefore excluded from all other cells." That instability, he added, is their down side. "The brain is absolutely packed full of omega-3s. However, there's also oxygen in the brain, and that's going to cause a reaction. They're going to oxidize. And that gradual oxidation is, in essence, a losing battle against brain damage. After a lifetime, the damage takes its toll," he said. Among the many ideas the Valentines explore in the book are the effects that the oxidation of omega-3s have on the brain. "One of the causes of brain aging is the oxidation of these compounds, which compose a large percentage of the brain. It's not too much of a stretch to think they're part of the gradual progression of brain aging and, possibly, some of the brain diseases that come later in life," David Valentine said. Despite the hazards posed by a lifetime of omega-3s, Valentine does not encourage people to toss out their bottles of fish oil. In fact, the contrary is true. "I consume plenty of DHA because I think the benefits to human health far outweigh the down sides," he said. "There's no question, for example, that omega-3s help brain development in children. The brain relies heavily on DHA, and will perform better when it is plentiful," he said. "But it's an inevitable catch-22. Human intelligence is derived in part from DHA, but DHA itself is inherently unstable." The effects of omega-3 oxidation are, in some ways, a function of the ever-increasing human life span. "The dangers have never been an issue in human evolution because humans didn't live to be 70 or 80 years old," said Valentine. "There was never this wall that people would hit, because they didn't live that long."